Abe Lincoln's Dream by Lane Smith. Abraham Lincoln was born on this day, February 12, in 1809. Both girls have been learning about Lincoln in school this week, along with that other February-born presidential icon, George Washington. (Monday is President's Day, and a day off from school.) We just so happen to have this beautiful book by Lane Smith checked out from the library. Abe Lincoln's Dream begins with the presidential dogs through the years. There are real reports that many White House dogs will not go near the bedroom of the sixteenth president. There are rumors of a ghost wearing a stove pipe hat. Then one day, a little girl named Quincy sees the man in the hat. He walks through a wall. He is disturbed by a dream about a ship, moving toward an indistinct shore. Quincy takes his hand and shows him what has become of the country since his death. Some of it is good. Some of it needs improving. "We're working on that." The words and imagery have a dreamlike quality. You can see them better at the Macmillan website. Or here in the trailer. There is also an interview with Lane Smith about this book from a 2012 episode of "All Things Considered" on the NPR website that is worth checking out. There just isn't much left for me to say. This lovely book speaks for itself. Go look. 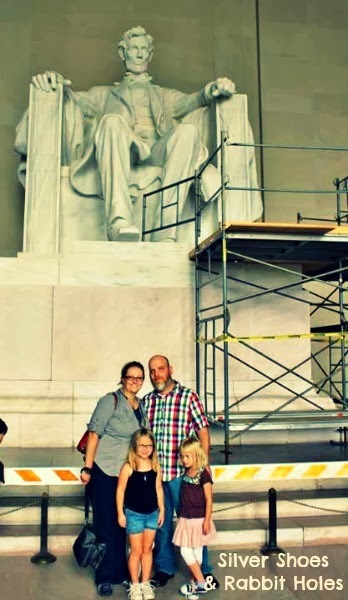 Visiting the Lincoln Memorial, August 2013. That's a great book! My boy did many book reports already about Lincoln! He would surely appreciate this one. I am saving the link to the video to show him later! this book looks so amazing and i have yet to see it in person! julia loves anything having to do with presidents (???) and I know she would love to read this!! !